Alyattes was the fourth king of the Mermnad dynasty in Lydia, the son of Sadyattes and grandson of Ardys. He was succeeded by his son Croesus. A battle between his forces and those of Cyaxares, king of Media, was interrupted by the solar eclipse on 28 May 585 BC. After this, a truce was agreed and Alyattes married his daughter Aryenis to Astyages, the son of Cyaxares. The alliance preserved Lydia for another generation, during which it enjoyed its most brilliant period. 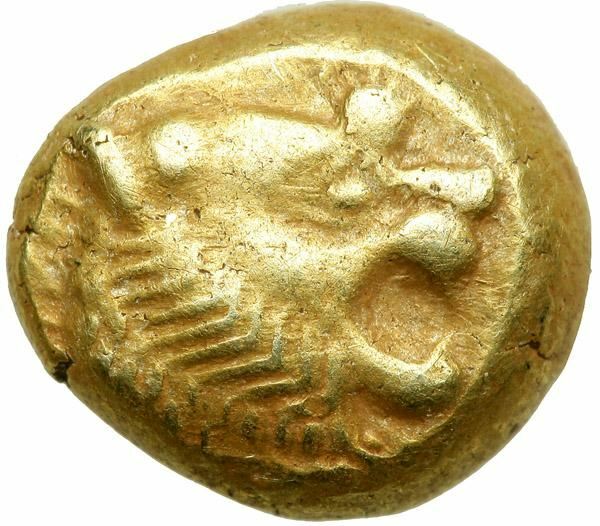 Alyattes occupies a unique position in numismatics because he likely produced the first true coins - struck to a fixed standard weight and with a uniform design. However, it took some time before ancient coins were used for commerce and trade. Even the smallest-denomination electrum coins, perhaps worth about a day's subsistence, would have been too valuable for buying a loaf of bread.